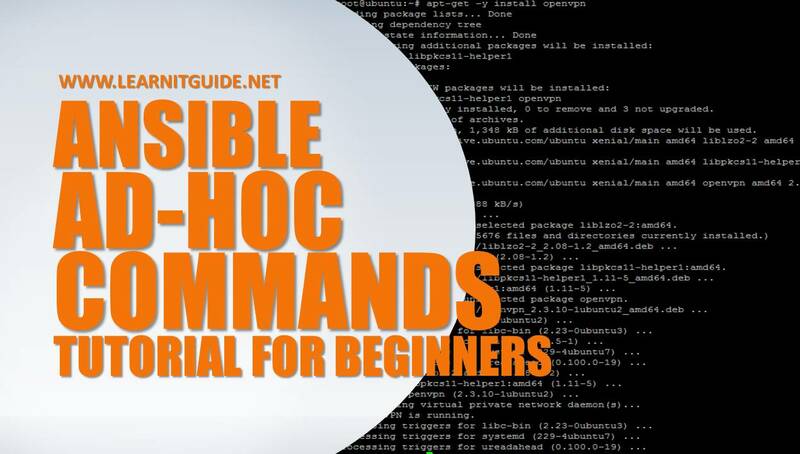 This article explains you about the Ansible Ad-Hoc Commands. At the end of this article, you will be able to understand What is Ansible ad-hoc commands and how to use ansible tool with some examples. What is Ansible Ad-hoc commands? An Ansible ad-hoc commands can be used to do some quick task to perform some simple operations through the command line. But real automation works using playbooks only. you may ask me if playbook is the real automation then Why do we use ad-hoc commands. Answer is so simple, Everytime you may not needed to perform a big operations, Some time we are required to perform some simple tasks. So we dont need to write a big playbooks. 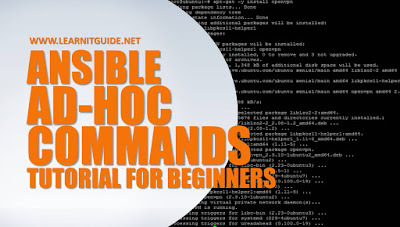 Also ad-hoc command is a easiest way to explore Ansible for beginners. Assume that, you wanted to restart or power off all of your infrastructure servers or if you wanted to get an uptime of all servers or to get an kernel versions or os information something like a small and quick tasks. On that cases, you can use a ad-hoc commands instead of writing a playbooks. We will explain you Ansible Playbooks in detailed in the next article. Playbooks can be used to do a many tasks. For example, if you want to install http web server, you are required to perform some multiple tasks. 3. Starting and Enabling the httpd service. For this kind of multiple task, you can write a playbook and execute it. Even you can use the same task using the ad-hoc command, but for each task you need to run a command manually. Hope you have got an idea? Why do we Ansible Ad-hoc commands and Playbooks? module or arguments - What actions to be performed. Lets take an example, Assume that, you wanted to get a uptime of a list of hostgroup named "servers" as per specified in Ansible Inventory host file. Refer this link to know what is Ansible Inventory. Also make sure you have configured passwordless SSH login authentication, Because Ansible works over SSH Connection by default. [root@localhost ~]# ansible servers -a "uptime"
Here we have used '-a' option rather than using a direct modules. This would execute a command 'uptime' on hostgroup "servers" and will give you the output of uptime in the screen. Also, you can use a module rather than using a direct command. Some commonly used modules are apt/yum, copy, ec2, file, service, template, and user. Let me use a module ping to find the server status instead of using direct command "ping". Here we have used a module "ping" with option "-m". To know the list of available modules in ansible, execute the command. Documentation for each module can be accessed from the command line with the ansible-doc tool. To know the required arguments and also to get a help of a particular module. Execute the below command. For example, to find the detailed information about the module "user". where "user" is a module used to manage the user accounts. Note : If any options starts with "=" in the above command, then its a mandatory option for the module. If `yes', will only add groups, not set them to just the list in `groups'. "name' is mandatory option to be used in user module. Example 1: Using module, Create a user called "john" using a module "user". [root@localhost ~]# ansible servers -m user -a "name=john password=redhat"
-a is options to pass the arguments "name=john password=redhat"
Above command will create a user call "john" in all the servers mentioned in Ansible Inventory file. Example 2: Without using a module "yum", install a httpd package. [root@localhost ~]# ansible all -a "yum -y install httpd"
Where, -a is a option to pass the arguement. If no module is specified, then it consider that as a comand and execute at the client servers. Example 3: Using a module "yum', install a httpd package. [root@localhost ~]# ansible all -m yum -a "name=httpd state=present"
Going forward, we will play more with ansible tool with some test cases.